History of Pennycress. Thlaspi arvense L.
Original interest in pennycress began as early as 1944, when Clopton and Triebold reported the oil potential of pennycress. 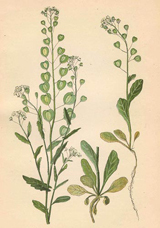 In the 1990's, pennycress was investigated as a potential new source for erucic acid in several industrial applications (Van Dyne et al., 1990). While the level of erucic acid in the seed produced by crambe was greater than that produced by pennycress, consideration of pests, crop rotations, and other factors made pennycress a potential new candidate for crop development (Carr et al., 1993). It was not until the recent energy crisis and soil fumigant issues arose that NCAUR began to reinvestigate pennycress. During this re-investigation, the first intent of pennycress production was as a potential bio-fumigant providing an eco-friendly alternative to methyl bromide (Vaughn et al., 2005; 2006). Methyl bromide is a soil fumigant used in high value crops such as strawberries. The glucosinolates in pennycress meal restrict its use as an animal feed, however, the presence of sinigrin, which in the presence of water disintegrates into allyisothiocyante, pennycress could serve as a valuable biofumigant. Besides killing weed seeds in the soil, pennycress meal would also have value as a fertilizer. After these original studies, pennycress was set aside as an industrial oil source, because its range of fatty acids from the 16 carbon-chain length to 24 carbon-chain length were quite common in other vegetable oilseed crops (Schill, 2008). However, priorities changed when the biodiesel industry started to take off. In 2007, the USDA decided to revisit the pennycress research based on the agronomic potential of pennycress, especially in light of the food versus fuel debate. In the wild, pennycress seed is produced in the spring and lies dormant until daylight hours shorten in the fall when it germinates. Its leaves grow low to the ground, providing good winter cover and preventing soil erosion. When warm spring days arrive in late April and May, field pennycress bolts and flowers reaching heights of 30 inches or so. It can be harvested in early June. It appears that pennycress is able to be harvested easily with existing equipment and doesn't suffer the shattering issues that often plague other new crops developed from wild plants. Initial screening of pennycress oil showed that it met all the parameters required for biodiesel. The cloud point turns out to be better than soy-based biodiesel and has less saturates making it more oxidatively stable than soy. The seed was found to have 36% oil with the major fatty acid as erucic at 38.1%, iodine value of 115 (Isbell et al., 2008). It is expected that a minimum of 40 bushels of pennycress can be produced per acre which will produce about 115 gallons of Biodiesel. With excellent biodiesel properties and a very short growing season, pennycress has a tremendous opportunity to leap to commercialization unusually fast. In the 2007 growing season, the USDA in collaboration with BioFuels Manufacturers of Illinois LLC (BMI), 10 acres of experimental plots were established from the previous year (Suszki, 2008). In replicated trails, preliminary studies investigated planting densities, seed depth, and planting methods, including: broadcasting and drilling. Air seeding into standing corn was also attempted. Two planting dates were used to determine the impact on yields when planted in early September compared with planting later in October. The USDA along with BMI even experimented with planting pennycress into a young corn field this spring in order to minimize the number of times the farmer goes into the field. One of the objectives is to replicate the plant's wild system where the seeds are spread in early summer, lie dormant until the fall, germinate in corn stubble and grow throughout the winter. Efforts are also underway to move the pennycress harvest date into May to make it easier to follow with a soybean crop. 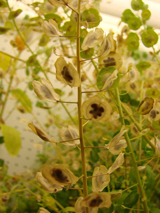 In 2009, WIU initiated the first plant breeding program aimed specifically at developing varieties of pennycress. The North Central Plant Introduction Station in Ames, IA, maintains 20 accessions of Thlaspi arvense which were just recently characterized for oil content and winter survival (Marek et al., 2008). These 20 accessions along with 12 other lines collected from various weed science programs from around the country are currently under evaluation at WIU. Primary objectives are set for early maturity, increased oil content, and altered oil constituents. Studies in water and nutrient requirements, insect and disease pressures, and environmental stresses will all need to be evaluated in the years to come. Research has also been initiated to search for herbicides that could be used to help establish optimal pennycress stands in the fall.